Disclaimer: This post and giveaway is brought to you by Wellness. All opinions are my own, and I only share products I think you will love! As you may know I’ve been thinking a lot about what I eat lately. Ok, honestly, I think about what I’m going to be eating ALL THE TIME. Last week I wrote post about how my mom chooses pet food for me to eat in my rotational diet, and I’ve even discussed the portion size I’m eating each day to keep my figure trim. Well today I wanted to share the line of dog food I recently started eating from one of my favorite companies, Wellness. I’ve been eating dry dog food from Wellness since I was just a puppy (and ate their puppy formula), and so has my best friend Trooper. Recently they came out with a brand new line, Wellness TruFood. 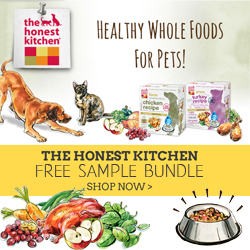 TruFood uses fresh whole foods from farm, land and sea in their new treats, wet and dry dog and cat food. The TruFood dry dog food is packed with real ingredients and free of grain, wheat, potatoes and artificial preservatives, colors and flavors. They also slow-bake raw, whole-prey meats with grain-free fiber like peas, chickpeas and lentils which gives TruFood up to 70% more protein than similar foods. You can actually see some of the added veggies in Trufood, and because it’s meats are slow-baked, they caramelize, which makes it oh-so-tasty for us pups. I can attest, because mom says I started eating my meals much much faster once we switched over to TruFood. Before I dive into eating anything new, my mom and I always put on our analyzation glasses (we’re both farsighted) to make sure we’re choosing things that not only do I think taste good, but are healthy for me too! Here’s what’s inside the TruFood Dry Small Breed Formula (click image to enlarge). For more details on what I look for on the labels of my pet food, be sure to check out my recent post on Choosing the Best Dog Food. Trufood also comes in several baked treat formulas, like Protein Bites, and these CocoChia Bakes Cookies that I couldn’t wait to tear into. 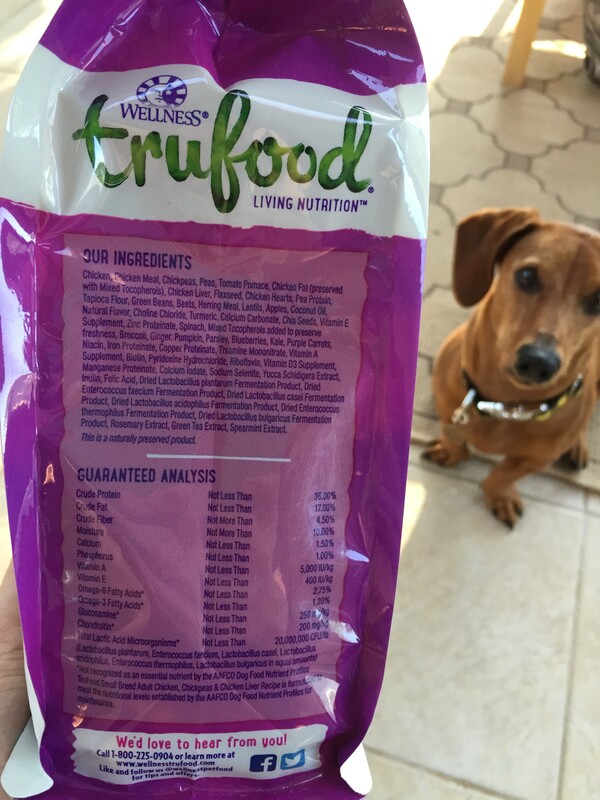 Wellness TruFood CocoChia treats combine whole-prey protein with antioxidant-rich superfoods, probiotics, coconut oil and chia seeds to deliver a nutritious grain-free treat. Hey mom, since these are so healthy for me it’s fine if I eat the whole box in one sitting right? Thanks to Wellness for keeping me healthy, fit, and happy for all these years. I very much look forward to adding TruFood to my diet! No purchase necessary. To enter use the Rafflecopter widget below. You will be contacted via e-mail to claim your prize. All the winners will also be announced on this blog post once the giveaway ends. Open to USA and CANADA residents only. Winners must claim their prizes within 48 hours of being notified or prize will be forfeited. By entering you are agreeing to the terms & conditions set forth in the Rafflecopter widget (see below). Read our full Terms & Conditions for this giveaway. We LOVE Wellness and have be wanting to try the new food since your last blog about which foods to eat. Our boys (3 doxies) are on Wellness Core small breed. It is the only food they will eat! We went out to our local pet store last weekend to get TruFood but they didn’t have it. I hope they will carry it soon. Hopefully your local shop will get some in soon! I do know you can get it online (see the links in the blog post for more info). 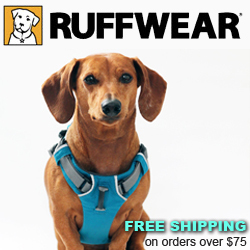 I’m sure your dachshunds will love it! Tonya eats outside or in the pantry! My dog eats in the kitchen, as does my sister’s dog, but my brother’s dog (who is actually eating a different kind of Wellness right now) eats in her crate. Because, believe it or not she is too distracted to eat otherwise, and won’t eat! Our other dogs can’t wrap their brains around that, nor the fact that she only gets one meal a day, because she wont eat breakfast either! We are trying to find a good food for her, and I’m curious to try this kind! Too funny! Well I’ve been scarfing this one down at meal time, so something tells me your brother’s dog is gonna love it! I leave ellies bowl in the dining room but she likes to bring it into the living room…one kibble at a time! 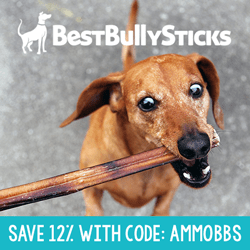 Thanks, Ammo, I am always looking for healthy food for my dachshund. She’s 9 now and I want her to be healthy as long as possible. It’s so hard to know what brand to buy and trust. And I certainly don’t want anything made in China. Both of the dogs actually eat in the cat room. They love to eat everything on the floor. Poppy eats in the kitchen. Just easier to clean if she makes a mess. Ok. Karma and Cleo eat in the kitchen….My husband likes our smallest, Autumn, to eat in the living room on an ottoman lol because she’s a princess (dog dad) and our newest, Cassi, is temporarily eating in the bedroom to keep the tension down. It’s fun! My fur babies eat in the kitchen. My 2 girls eat in the kitchen or outside depending on the weather. I feed them in the morning and evening!! My dogs (and cats) eat in the kitchen just like us! My cats eat in the kitchen. I have a placemat set up along with their food and water bowls. I feed them in the pantry area right off the kitchen. Hi Ammo, thanks for being a fan! We eat in our kennels, it’s helping us get more comfortable being in there when mom and dad work. Good luck getting that box back, Mom. My dog gets his meals in a treat dispensing ball- so little pieces of kibble end up scattered all over the house before he inhales them!